Curatorial Intern Thomas Murphy randomizing experimental units to induce dormancy before they are subjected to chilling treatments. Polly Hill was devoted to horticultural experimentation and raising plants from seed. She also named many of her favorite plants, including several cultivars (cultivated varieties) of stewartia. To get an exact duplicate (a genetic clone) of a plant, it must propagated asexually, which eliminates the genetic variability found in seed propagation. Typically this is done through rooting cuttings. While many of Polly’s stewartia introductions have made it beyond our borders, some have not, primarily due to difficulties with propagation. As part of my curatorial internship I was tasked with looking deeper into these propagation issues. A longtime problem with growing stewartia trees from cuttings is that after rooting, the cuttings fail to break dormancy the following season. This issue with overwintering has puzzled plant propagators and limited the distribution of some of Polly’s most beautiful cultivars. 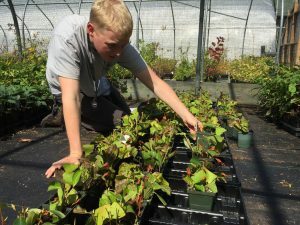 Studies have shown a correlation between several environmental factors involved in overwintering cuttings. One critical factor is the effect of a chilling period (exposure to cold temperatures) in regards to the dormancy requirements of stewartia. What is dormancy and how does it work? Dormancy is defined as the process by which active growth subsides to minimize exposure to harsh weather conditions. Sometimes described as a “deep sleep,” dormancy is a complex physiological process that remains somewhat mysterious. There are two types of dormancy relevant to the asexual propagation of stewartia. Endodormancy, also called true dormancy, occurs after leaf loss and inhibits the buds from further growth due to colder conditions. Inducing and exiting endodormancy is known to be controlled by the changing concentrations of plant hormones that are signaled by seasonal temperature changes. A plant cannot exit endodormancy until its undergoes a significant period of temperatures near or below freezing. Once this chilling requirement is fulfilled, plants enter into another type of dormancy: ecodormancy, also known as quiescence, which is denoted by bud swelling. Plants in this state are on standby, awaiting warmer temperatures that will induce bud break and allow them to exit dormancy. PHA’s current procedure is to overwinter first-year cuttings in a greenhouse covered by polyethylene; however. this could be detrimental to the survival rate of stewartia. These newly rooted plants are entering endodormancy, but the greenhouse environment is more susceptible to temperature fluctuations—heating up on sunny days—than the outdoors. This could mean that the dormant plants inside the greenhouse do not receive the necessary chilling conditions that would take place outside in a natural environment. The possible result is a low survival rate the following spring. To better understand how PHA can improve propagation and overwintering procedures for stewartia, I designed an experiment to assess the length of chilling period in combination with the choice of media used for rooting and overwintering. 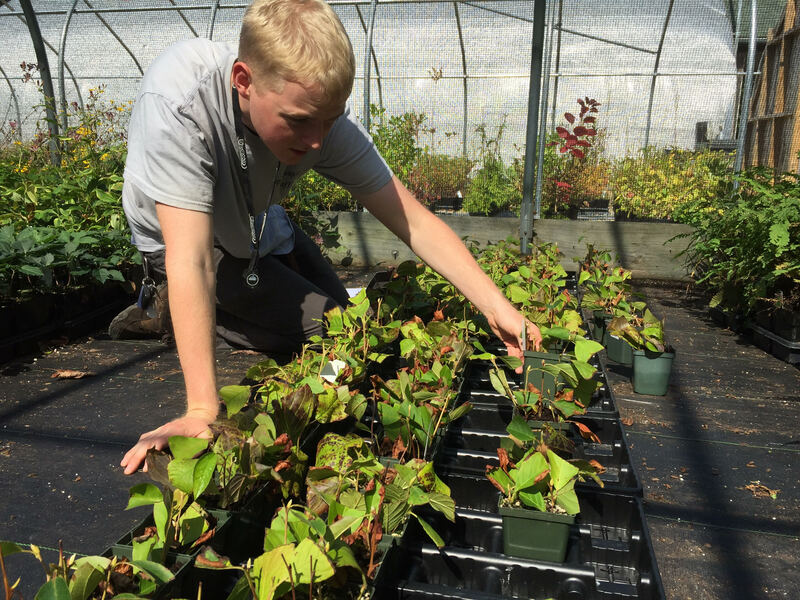 The primary goal of my experiment is to establish a reliable protocol for propagating and overwintering stewartia cultivars in the PHA collection, and also provide further insight for others who propagate these plants in the future. This past June, four PHA stewartia introductions were rooted under mist in pots containing two different types of soil media. All cuttings were placed outside to induce endodormancy under natural conditions. These rooted cuttings will then either be moved to chilling units in the basement of the EBL to endure varying chilling periods or to storage in which they will accumulate no chilling period (control group). In the summer of 2018, each cutting will be assessed. Whether or not the plant exits dormancy and lives until late summer, along with root quality, will indicate the results of the various treatments. I’m hopeful that these testing procedures will help us gain insight into the successful propagation of one of PHA’s most popular plant groups.